The Great Southern Hotel Melbourne was formerly known as the Enterprize Hotel is superbly located in the heart of the Melbourne CBD. The Great Southern Hotel is in the perfect location for both the tourist and business client alike and features a wide range of affordable hotel rooms and suites that are comfortable and guaranteed not to break your budget. Accommodation in this discount Melbourne hotel places you within easy walking distance of the Melbourne City Centre and minutes away from Melbourne's Crown Casino, and close proximity to all the tourist attractions that Melbourne has to offer. For those wanting to venture further afield the Spencer Street station is a short walk, while the Melbourne Airport is a short drive away. This amiable Melbourne City Hotel offers comfortable, affordable accommodation ranging from single to one bedroom suites, with rooms opening onto a delightful, courtyard - a rare and charming luxury in the heart of Melbourne CBD. So why not come and stay at the Great Southern Hotel for your next trip to Melbourne. 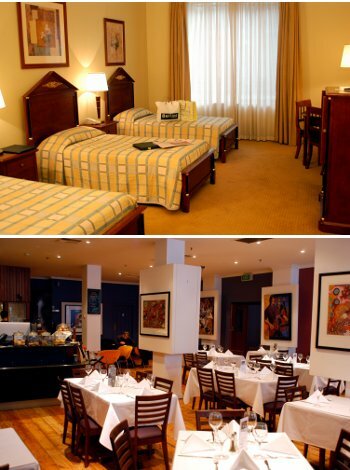 Small Superior Hotel Room - This budget hotel room is very compact and features a Double bed, vintage style with ensuite bathroom, air-conditioning, heating, cable TV, tea & coffee making facilities, phone, hair dryer and is just a short walk to Etihad Stadium & Crown Casino. Superior Double Hotel Room - This stylish and spacious hotel room contains a comfortable Double bed, private ensuite bathroom, air-conditioning, free cable TV, phone, alarm clock, ironing facilities, hair dryer and is just a short walk to public transport, shops and corporate offices. Twin Classic Courtyard Room - This hotel room is situated around a central courtyard and has 2 Single beds as well as ensuite bathroom, air-conditioning, heating, cable TV, ironing facilities, hair dryer, tea & coffee making facilities and safe deposit box. Executive King Hotel Room - This modern and stylish hotel room can sleep 2 people on either a King or 2 King Single beds. It also has an ensuite bathroom, air-conditioning, heating, phone, hair dryer, cable TV, ironing facilities and tea & coffee making facilities. Twin Double Deluxe Hotel Room - This spacious hotel suite allows for multiple guests to stay in a single room without feeling too crowded. It features 2 Double beds, an ensuite bathroom, air-conditioning, heating, ironing facilities, cable TV, hair dryer, phone, internet access and tea & coffee making facilities.